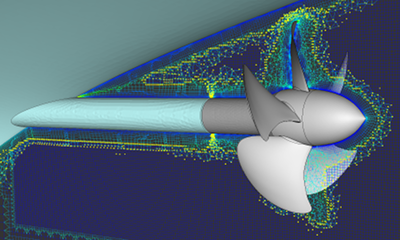 Pointwise has released a major update to its computational fluid dynamics (CFD) mesh generation software. With its origins in a multiyear development effort funded by the U.S. Air Force for overset grid assembly, this latest Pointwise release includes a suite of tools that provide increased automation and flexibility in mesh topology creation, mesh types and mesh quality assessment. A cut plane through an overset mesh system generated for a container ship configuration. Automated near-body mesh is generated using the new Build Blocks feature while off-body meshing utilizes new voxel hex-dominant meshing technology. From the standpoint of mesh topology, Pointwise now includes Frameworks, the ability to generate meshes within coordinate systems local to geometric components (for example, a fuel tank) and then transform them into the global coordinate system (for example, placing the fuel tank below the aircraft’s wing). A new top-down technique called Build Blocks provides rapid volume mesh creation around selected meshes such as would be used for overset refinement. The ability to create surface meshes that are independent of geometry model topology has been simplified with the addition of a curve drawing mode that does not rely on the geometry model’s parametric space. Voxel blocks are a new top-down, volume mesh generation technique that quickly encapsulates a boundary layer resolved mesh within a Cartesian grid. Mesh adaptation through the use of sources for overset interpolation remediation now influences the surface mesh in addition to the volume mesh. Mesh quality assessment now includes filters by which cell visibility can be limited to a range of metric values. Filters also provide the basis for creating point cloud sources for mesh adaptation via the new Snapshot capability. Planar cuts through a mesh can persist outside of the Examine command for monitoring the effect of mesh changes on mesh quality. Pointwise Version 18.1 also extends the software’s plugin API to provide users with the ability to add, at runtime, their own mesh import capabilities. V18.1 is delivered with new mesh importers for FUN3D, CFD++, OpenFOAM®, SU2, CRUNCH, ANSYS CFX® and ANSYS Fluent®. The software includes dozens of other smaller features and defect corrections. Pointwise, Inc. is solving the top problem facing computational fluid dynamics (CFD) today – reliably generating high-fidelity meshes. The company's Pointwise software generates structured, unstructured, overset and hybrid meshes; interfaces with CFD solvers such as ANSYS FLUENT, STAR-CCM+®, OpenFOAM, and SU2 as well as many neutral formats, such as CGNS; runs on Windows, Linux, and Mac, and has a scripting language, Glyph, that can automate CFD meshing. Manufacturing firms and research organizations worldwide have relied on Pointwise as their complete CFD preprocessing solution since 1994.